The Make Space Now Offers Welding! I have slowly been sourcing parts for the next addition to the make space but as of tonight it is finally completed. 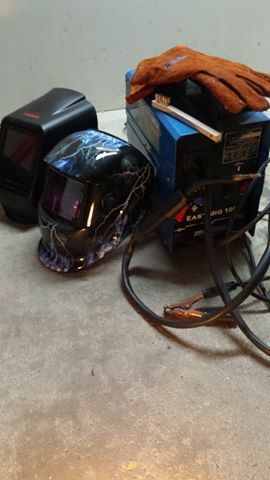 I bring to you the next member of our tool family - The MIG Welder! I have several spools of Lincoln 0.030 flux core wire that you can have which I will never use. I’ll drop them off at the Space. I only use solid wire and shielding gas. Welding supplies are in bin 26. Put them in there if you stop by and nobody is around. I would love to learn how to weld! Are there going to be any Welding 101 classes soon? Hopefully although I am still new to it myself. I know a few of our members are highly skilled and we could ask them for some guidance in regards to classes. Until then youtube is always a big help. You know it, Youtube is always the first place I go to. I’m just a little fearful. Welding looks more dangerous. I’ve never thought about welding as an option when building things. If I need to create something larger, I’ll go wood: plywood, MDF, whatever. So I’m more curious about what new possibilities we get when we consider metal as a material for makers.